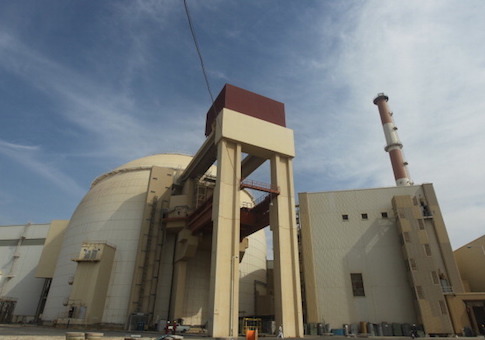 Iran is being given a pass from the administration to continue nuclear projects at the Arak, Bushehr, and Fordow facilities, all contested sites that have been at the center of Tehran's secretive nuclear enrichment work in the past. The decision is part of a package of concessions granted by the Trump administration to Iran and European allies as a bevy of new U.S. sanctions go back into effect. In addition to permitting continued nuclear projects, the administration has walked back its vow to cut Iran's oil exports to zero and fully disconnect Tehran from the international banking system. "We are specifically permitting nonproliferation projects at Arak, Bushehr, and Fordow to continue under the strictest scrutiny to ensure transparency and maintain constraints on Iran," the administration announced. "Permitting these specific activities to continue is an interim measure that preserves oversight of Iran's civil nuclear program," according to the statement, which has sparked fierce pushback from Iran hawks. "It enables the United States and our partners to reduce the proliferation risks at Arak, maintain safe oversight of operations at Bushehr, limit Iran's stockpile of enriched uranium, and prevent the regime from reconstituting sites such as Fordow for proliferation-sensitive purposes." "This oversight enhances our ability to constrain Iran's program and keep pressure on the regime while we pursue a new, stronger deal," the administration maintained, hinting at efforts to preserve the landmark nuclear deal that Trump abandoned in frustration over what he described as glaring loopholes that have empowered Iran's global terror operations. "We are not issuing waivers for any new civil nuclear projects," according to the administration. "We are only permitting the continuation for a temporary period of certain ongoing projects that impede Iran's ability to reconstitute its weapons program and that lock in the nuclear status quo until we can secure a stronger deal that fully and firmly addresses all of our concerns." Advocates of a hardline approach to Iran in Congress say they are not being fooled by the administration's rhetoric, which has historically been tough but is not being backed up with action. "It's not maximum pressure if Iran gets to keep selling oil, gets to keep accessing the global financial system, and—now—gets to keep working on its nuclear program with help from Europe, Russia, and China," said one senior Republican congressional official. "The administration is even letting Iran continue working with partners at Fordow, a bunker built into the side of a mountain which even Obama used to say needed to be closed," the source said. "The policy announced today will lock in the nuclear deal under Trump's watch." Added a second GOP congressional official working on the matter: "The pro-Obama deep state and Tillerson holdovers in Foggy Bottom strike back." David Albright, a veteran nuclear expert who runs the Institute for Science and International Security, told the Free Beacon the waiver issued for the contested Fordow nuclear facility is "hard to swallow." "It was grouped with the Arak reactor and a nuclear safety center, and hard to separate off," Albright explained. "Those two provide concrete benefits, namely a reactor no longer able to make much plutonium and less fear that Bushehr, or for that matter the little Tehran Research Reactor, will melt down and spread dangerous radiation throughout the region." "Fordow employs centrifuge experts in a non-uranium enrichment process, which is good, but the whole process is quickly reversible," Albright warned. "Those experts could be rapidly reassigned to work on advanced centrifuges to enrich uranium and Fordow could be restarted to enrich uranium." With Fordow continuing its operations, the issue is likely to "complicate, but not unravel future negotiations aimed at ending enrichment in Iran, which appears to be the Trump administration's goal," Albright said. "It is justified since Iran has no civil need to enrich uranium. Given its immense cost, and the ability to buy enriched uranium for civil purposes internationally at far less cost, any increase in domestic Iranian enriched uranium production should be viewed as military activity." Moreover, if "Iran violates the nuclear limits or refuses IAEA [International Atomic Energy Agency] inspections, then the E3 [in Europe] will have a responsibility to snap back sanctions under the JCPOA," Albright added. "In anticipation of that possibility, the United States should continue to publicly make clear that it will not allow Iran to acquire nuclear weapons." Organizations that have supported the Trump administration's moves on Iran also have expressed caution with the new concessions, another sign of mounting frustration among those who expected the White House to get tough with Tehran. "The implementation of a maximum pressure, full economic blockade on Iran is the only way to force the regime to change its malignant behavior," United Against Nuclear Iran (UANI) Chairman Sen. Joe Lieberman and CEO Amb. Mark Wallace said in a statement. "This campaign should include action by SWIFT to disconnect Iranian banks and no repeat of these oil waivers after 180 days. Anything else will continue allowing the world's leading state sponsor of terrorism to fund its global terror campaign."